If Mukhtar Ablyazov envisions an eventual triumphant return to Kazakhstan, things just got more difficult. Wednesday, a court in Astana convicted Mukhtar Ablyazov of a range of crimes, from embezzlement to organizing a criminal group, abuse of office, and financial misdeeds. Ablyazov — a fugitive ex-banker and colossal thorn in the side of Kazakh President Nursultan Nazarbayev — was sentenced to 20 years in prison. Ablyazov is unlikely to ever serve the term as he was tried and sentenced in absentia. “We must reform the political system to have a parliamentary republic and in the future political system I would like to take the role of prime minister,” Ablyazov said, suggesting that it was possible to achieve in three years. If Ablyazov envisions a triumphant return to Kazakhstan, Astana has added another layer of difficulty to the task. 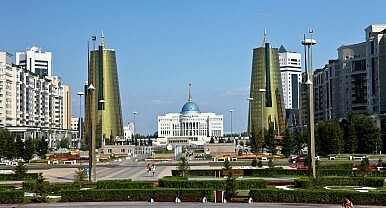 Sham or not, the conviction is the books in Kazakhstan. Kazakhstan’s next presidential elections are slated for 2020, at which point Nazarbayev will be 80 and, if he decides to run, aiming at a sixth term at the helm in Astana. Succession is a perennial hot topic among Central Asianists. Kazakhstan experts all likely have their guesses for who stands next in line, and there’s an array of regime elites and relatives with potential. Astana, it seems, has made efforts to prepare the system for a managed transition by primarily cutting out the kind of uncertainty that democracies usually entail. As a rule, genuine opposition candidates are eliminated long before the elections are due. The most typical approach in the past has been the fabrication of criminal cases and even the imprisonment of potential opposition candidates. When the law passes, authorities will no longer have to resort to such attempts. Kazakhstan hasn’t had a single election judged free and fair by Western observers. Over the course of five elections two things have happened: the percentages won by candidates not named Nazarbayev have shrunk and the people running against the incumbent have increasingly become hollow figures parroting the president’s positions. In 1991, Nazarbayev stood alone on the field of contenders and took 98.8 percent of the vote. The next election, in 1999, his percentage dropped to 81 percent and the Communist Party’s candidate scored 11.9 percent. In subsequent elections — 2005, 2011, and 2015 — Nazarbayev’s numbers have crept back toward the 1991 benchmark. The former communist ran as an independent in the 1999 election and shortly after founded his Otan (Fatherland) party, which became Nur Otan in 2006. In 2015, a court ruling dissolved Kazakhstan’s Communist Party. Ablyazov may envision himself in a leadership position and agitating for Nazarbayev’s downfall; but the political elites in Astana, Nazarbayev and his many supporters, will do everything to keep him at bay. It’s not clear what pull Ablyazov has among Kazakh voters. Surely the conviction will be reported widely and in politics even a sham can besmirch a name.